Stress ball is a great way to release stress. It is a tool through which you can stimulate your attention towards something different, allowing the mind to divert to something trivial, thus giving you a chance to recuperate. There are different types of stress ball available in the market, but it is something which you can easily make at home, using things which are commonly available in every household. This article will detail one of the most simplest method to make a stress ball. Take the rice in a small bowl and add some baby powder into it. The baby powder will prevent the rice from sticking, once it is inside the balloons. Mix the baby powder with the rice thoroughly and set the bowl aside. Now take one of the balloons and strap it on the top end of the soda bottle. We have not used a simple funnel here because its base is not as wide as that of a large soda bottle cutting. Scoop up some rice with the help of the soda bottle funnel and fill it inside the balloon. As the balloon gets a little full, more effort will be required to get the rice inside. Work by stretching the balloon until you get a complete size, nearly equal to the entire circumference of the balloon. Once you get to that point stretch the upper portion of the balloon some more and ensure that a neck is created. You can add some more rice now, until you get the preferred size. Now take the upper end of the balloon and roll it downward - ensuring that the air is removed from the balloon all the while - so that the end is secured inside the rice. Take the second balloon and cut the top neck off it. Now use the remaining part to trap all of the rice filled balloon. 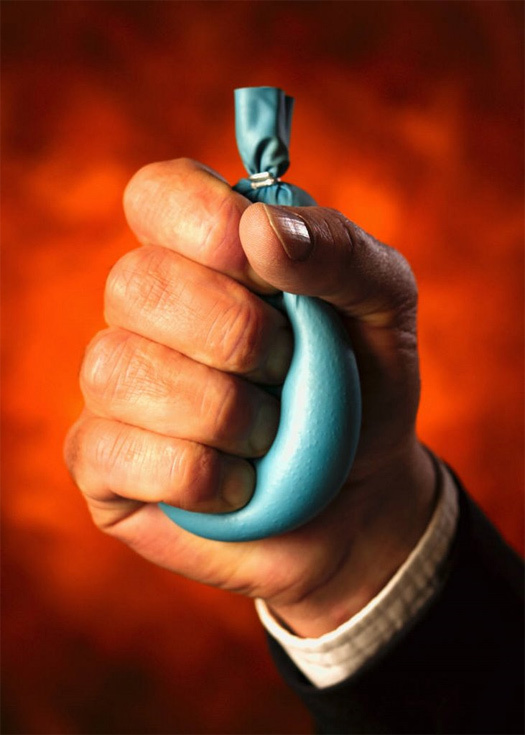 Once this is done, your stress ball is ready for use.